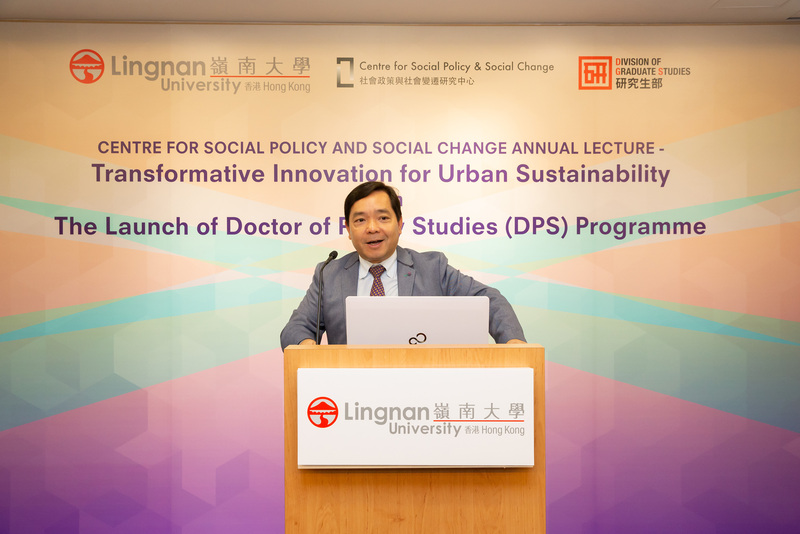 It was an evening that underlined both the ambition and the contemporary relevance of Lingnan University’s Centre for Social Policy and Social Change (CSPSC). 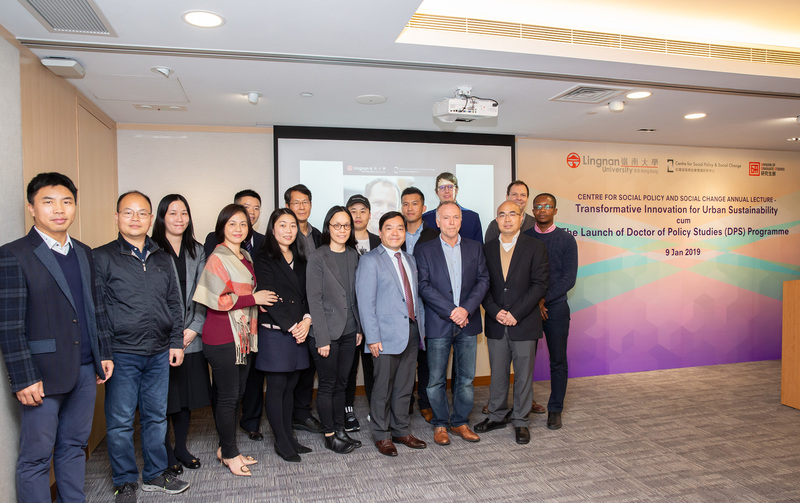 Not only did the January 9th event at the Hong Kong General Chamber of Commerce feature the CSPSC’s first annual lecture, in which an internationally renowned academic tackled a topic of huge global significance, it also afforded an opportunity for the launch of our exciting new Doctor of Policy Studies (DPS) Programme. Vast population shifts from rural areas to cities is a global phenomena, but one that is particularly pronounced in Asia. Given the nature of the problems, and opportunities, this migration is generating, Professor Ray Forrest, Director of the CSPSC, was delighted to welcome Adrian Smith, Professor of Technology and Society, at the University of Sussex’s Science Policy Research Unit, to talk about ‘Transformative innovation for urban sustainability’. Before Professor Smith’s presentation, Vice President and Director of Division of Graduate Studies, Professor Joshua Mok put the recently established CSPSC, and its new doctorate programme, into context. 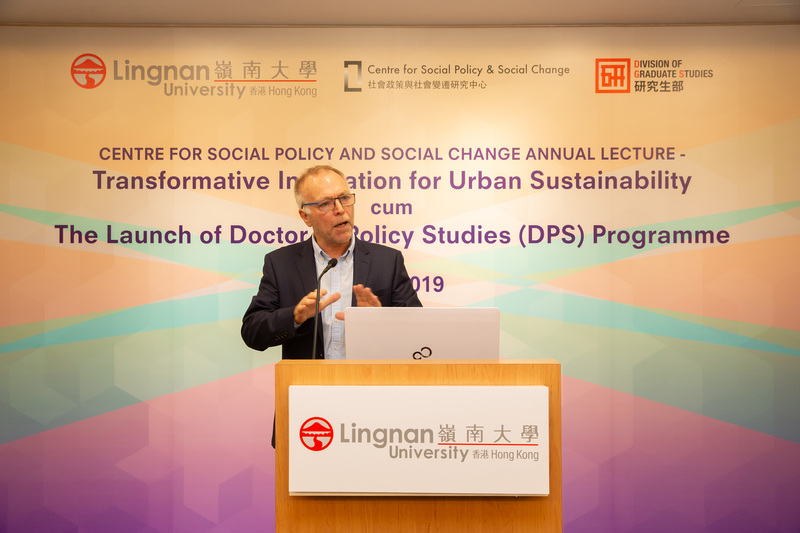 “We believe Lingnan University will be a great location for promoting interdisciplinary research, and inter-university and international research in the areas of social policy and social change,” he noted. The core courses this team will deliver encompass: globalisation, changing governance and policy analysis; research methods in policy studies; a professional writing workshop; guided study in policy issues; and, policy dissemination and strategic communication. As well as a further range of elective courses, experiential learning elements such as field visits, along with opportunities for exchange visits, are also integral to the DPS. Dr Smith began his presentation by looking at the ‘ecological footprint’ for Hong Kong, which, surprisingly, was similar to that of his low-rise UK home town of Brighton. “If everybody on the planet lived a Hong Kong lifestyle we’d need 3.9 Planet Earths to provide the resources,” he observed. While this is clearly unsustainable, he acknowledged that the institutions, organisations and individuals that form the incumbent bases of power may feel threatened by challenges to the status quo. Taking a step back he then looked at the way in which policy makers have, over the years, ‘framed’ innovation in terms of what it is, where it comes from, what it can do, and how to promote it. Following the Second World War, in the developed economies, R&D was framed as an engine for economic growth. While, from the 1980s onwards, innovation was seen as a means to boost competitiveness in the context of globalisation, offering societies the prospect of catching up or, at least, not being left behind. Now, Dr Smith saw a third, emerging, framing of innovation as transformative. “Sustainability involves profound transformations to the socio-technical systems underpinning societies,” he pointed out. These systems encompassed, among other elements, energy, mobility, housing, food, entertainment, manufacturing and water. “Transformative innovation means starting from a different vantage point and with a different mixture of people pioneering sustainable socio-technical systems.” Urban laboratories – such as makerspaces, hackerspaces and fablabs - can support a process of developing and testing new ideas, he suggested. Makerspaces, for example, encourage participation, plurality, dialogue and the collaborative exploration of practical activities with a transformative potential for sustainability. At an institutional-level, he saw a tension between a ‘fit-and-conform’ approach to sustainability - in which the prevailing institutions act as a filter on ideas, with a view to ‘fitting them into’ existing policies - and a ‘stretch-and-transform’ approach, that sees institutions act as responsive enablers for experimentation that may lead to their own replacement. 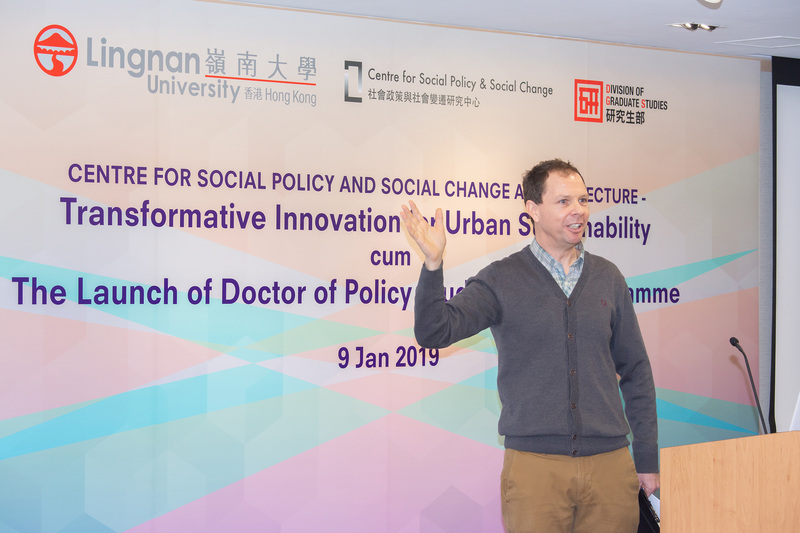 With the creative energy they possess, Dr Smith said cities such as Hong Kong and Shenzhen could develop into the types of crucibles for change required for transformative innovation.